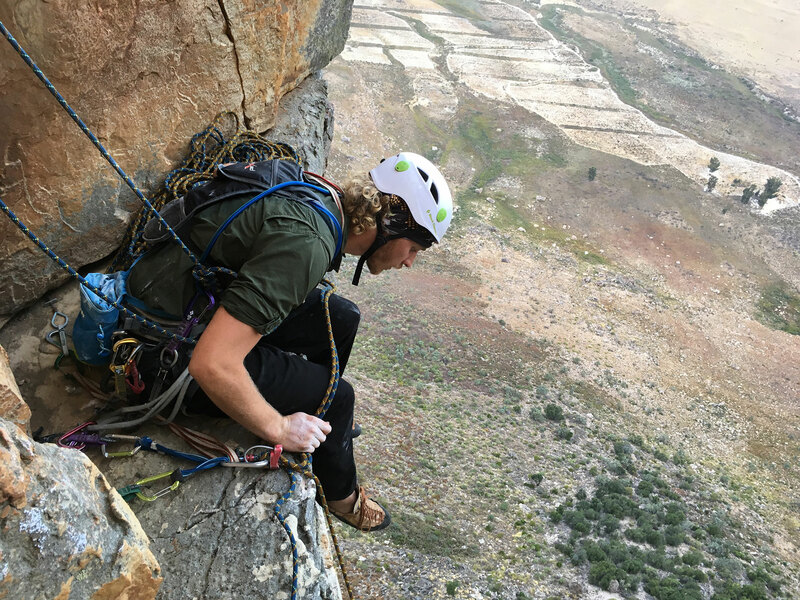 Faith, Hope and Charity are three 100m proudly protruding sand-stone buttresses in Rocklands located in the northern reaches of the Cederberg Mountain range. Best spotted as you wind your way down the Pakhuys Pass looking back over your left shoulder coming from Clanwilliam headed towards Calvinia. 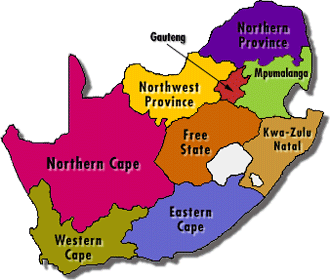 Often when relaxing at the De Pakhuys pool I found myself staring at these faces, the magnetism of the rock undeniable. 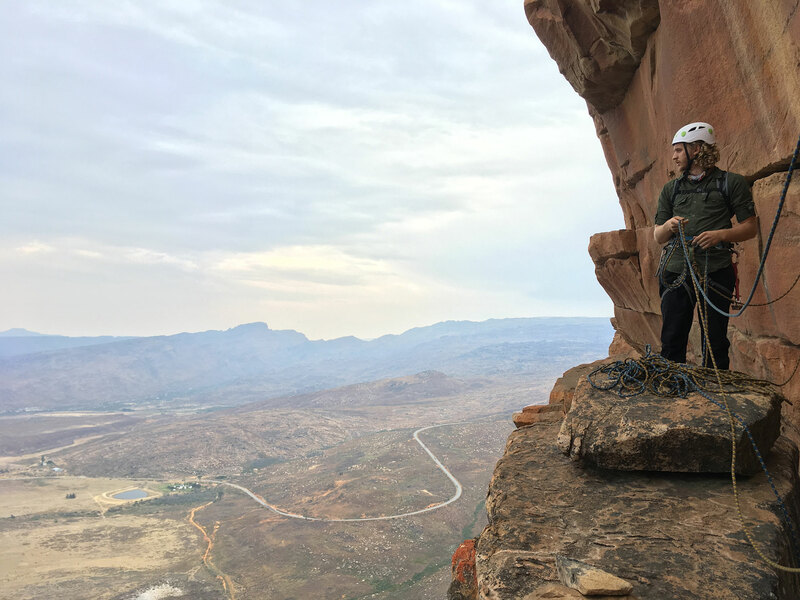 Once I heard from Andrew Court that there were established traditional climbing routes on these buttresses, the words “Let’s climb it!” sprang from my lips unprovoked. It was a crisp morning at De Pakhuys campsite, we set off at sunrise. A strong team made up of Powerhouse Andy, Vegetable Stew and The Bulgarian with a signed copy of the infamous ‘Book of Lies’ to guide us. Departing from the cluster of trees – guns blazing – we took the bushy, direct approach. Our path finding or rather path creating was superbly absurd. It would have been far too easy to walk in single file, so the three of us walked out in a line abreast ensuring none of the razor-sharp bushes remained unhacked by our shins. After an hour of huffing and cussing our mountain madness had only just began. We arrived at the first significant rock band, but the faces looked measly so we scrambled up them carrying our 16 kilo packs. 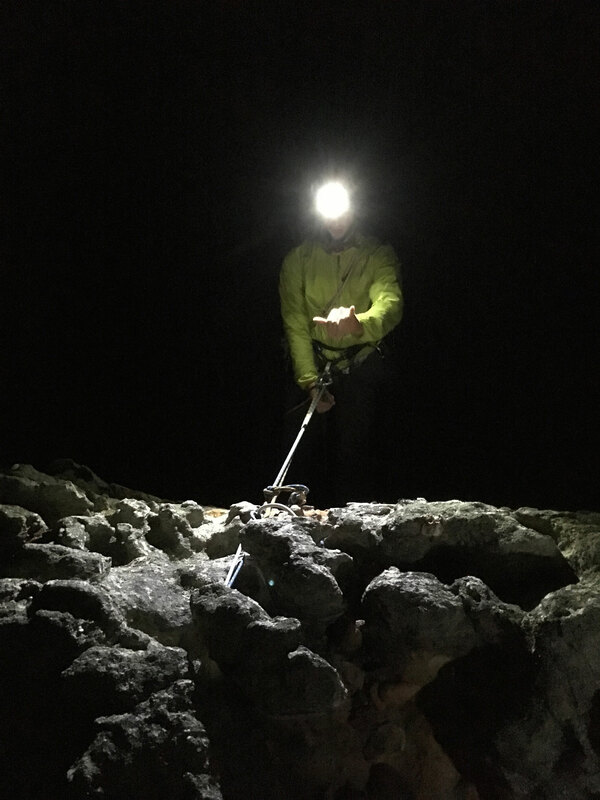 Later it was decided that it was by far the most dangerous free solo we had ever done, numerous rocky chicken heads popping off without the slightest concern for our safety. Arriving at the magnificent cave system at the edge of the Hope Buttress we howled and were greeted by echoes. The lazily gliding black eagles and lowing cows in the valley below were clearly unimpressed by us noisy primates. 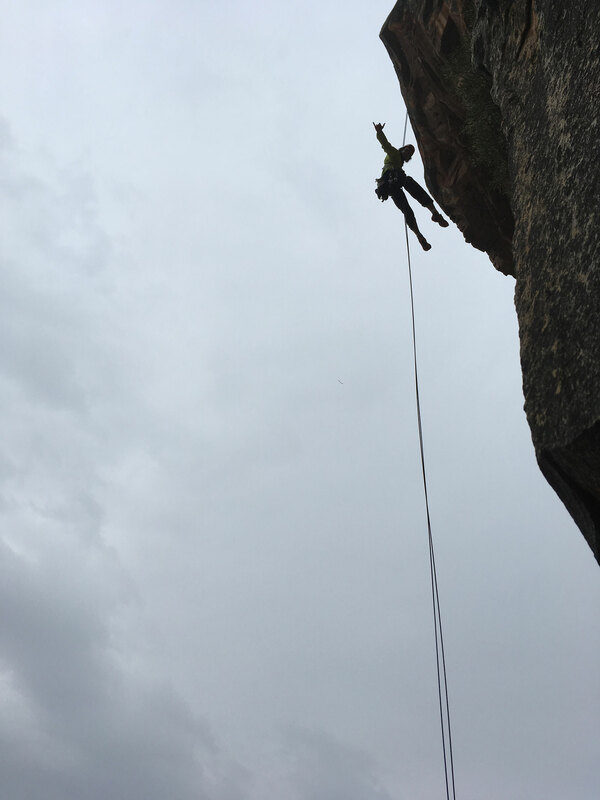 The first route we decided to tackle was ‘Butterfinger Crisp’. We geared up; chinged, chonged and finally cha’d to establish the order of leads. It was I who would take the first pitch of what we convinced ourselves was the correct line. The Book of Lies earned its title by revealing it was no true story after all, nevertheless a novel comfort to have by our sides. The only way to go was up. 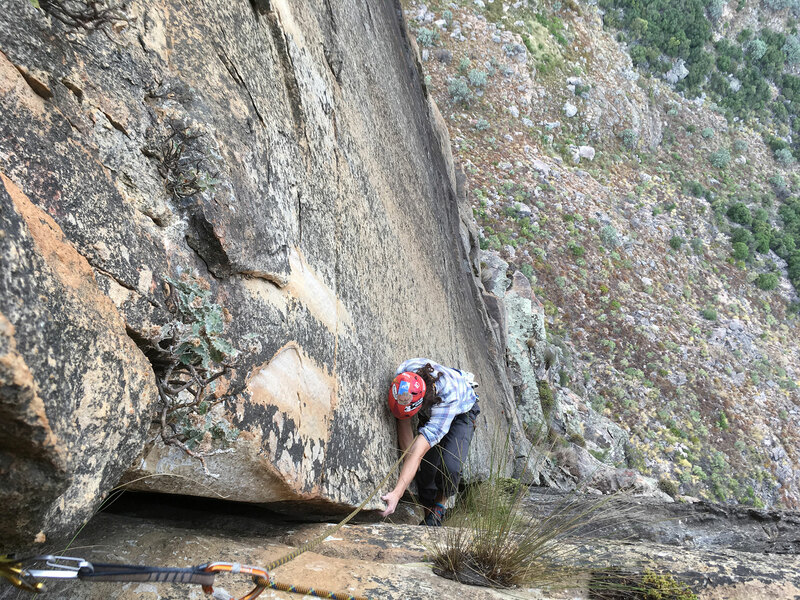 The rock was of superb quality, ‘Butterfinger Crisp’ certainly has it all; balancey ledges, laybacks, a beautiful chimney which leads to a desperately crimpy sequence on the 2nd pitch. Pitch 3 was highlighted by a majestic layback which is heaps of fun. Finally pitch 4 we butchered with slings, wrapping a seemingly endless sea of chicken heads all the way to the summit. Topping out directly at the natural anchor abseil point we couldn’t have had it easier. The day had gone far too smoothly up until this point, were we unwittingly provoking an epic? Back at the cave Andy had his power-house nap awaiting the coffee to kick in whilst Vegetable Stew and I went hunting for Dassie skulls. We reignited our childlike energy with vigorous chinging and chonging for the next route. Powerhouse Andy took the cake, we found a line which looked like a good route; having no real idea where it would lead us. We diagnosed it as ‘Ginger Bread Snap’ following another lie from the book. Rappelling down the 100meter rock face my shadow was instantly painted across the mountain by electric flashes as they plunged into the valley. On our 2nd abseil the rope got stuck and we tugged, contemplated, tugged again, then made a final screaming tug which luckily always seems to work; popping the rope out from the top. If our initial approach had seemed radical our midnight descent undoubtedly put us on the ‘Top 10 most reckless ways to descend a slope’ list. Straight down the wet 15m steep rocky outcrops, through high sharp shrubs and loose scree we blundered. We spotted our vehicle in the rain, the glimmering reflection of the faint yellow number plate a beacon of light which truly warmed the heart. Dancing and singing hip hop on our way back to De Pakhuys campsite where everyone had been watching our headlamp working its way through the dark, slippery skyline just hours before. We made it! 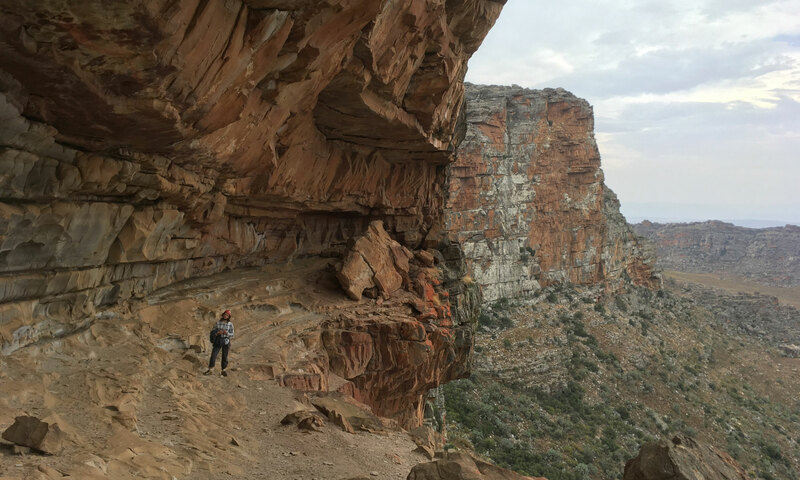 Permission from Thuys Kruger at De Pakhuys is required as it is his land that you will need to access in order to climb these magnificent Buttresses. If you have a 4×4 one can drive all the way to the foot of the mountain I would not recommend driving this sandy road with any other kind of vehicle. 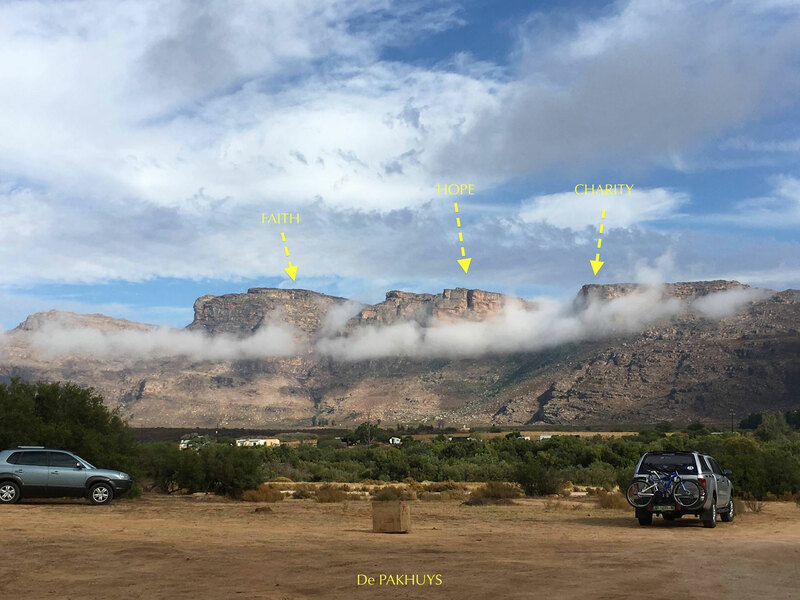 The turn off is about 1km left of the De Pakhuys Campsite driving away from Clanwilliam. Sign Posted Kleine School, a fork off road to the immediate left is a sandy jeep track which follows the edge of a rooibos plantation follow this track until reaching a collection of large trees at the foot of the mountain. 1.5+ hour off trail hike following very scarce cairns follow the clearest line to the cave system. Stay away from the large trees in the gully unless you are a full blown gorilla with a thing for path clearing with your shins & fists. Highly recommend camping at the caves at the base of the climbs yet there is no water source which we located. Nice read! Those are indeed magnificent red butresses. nice looking crag in that cave pic! Super good looking rock indeed!